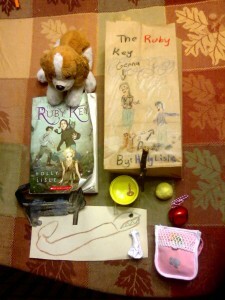 A couple weeks ago, the Little One and I finished The Ruby Key, a youth fantasy novel by Holly Lisle. As you can see, we gave our paperback quite a workout; it was brand new when we started. She—that is, the Little One—then collected 10 items from of the story for a “Book Bag,” a show-and-tell project she and her classmates do in school. The Little One’s classmates enjoyed her presentation, and one even asked to borrow the book. But apparently, she didn’t make it very far through. In any case, here are our online reviews of The Ruby Key. Holly portrays wonderful characters, led along an exciting adventure, in a vibrant fantasy world. All of this is the excellence you’d expect from Holly Lisle. ‘Nuff said. Genna, the narrator and main character of the story, was more clueless than I would have liked… and more shallow than any of Holly’s other characters. I’m not sure what happened here, but at certain critical junctures in the story, I found myself wondering how Genna would react, even though I felt I should have known. Yes, I knew she would step up to the plate and do “the right thing,” because that’s what fantasy heroines do. But I felt as though I didn’t truly understand what was happening inside Genna’s heart and mind. I really didn’t feel I knew who Genna was, except that she felt confused and incompetent and little, until it was time to do “the right thing,” when she acted blindly (sometimes on misinformation) so that everything could just happen to turn out okay. But what was Genna’s struggle in all this? And how did she grow? I don’t know. Or rather, I could more easily get inside the heads of the other characters, even though Genna’s were the thoughts on the page. That’s not to say that I had no sympathy for Genna. I had lots of sympathy, and maybe that’s all that Holly (or her editor?) was trying to accomplish with the character: lots of sympathy, but make Genna the “every American girl” character, full of self-doubt, but with little personality of her very own, ready to be filled with the identity of whomever is reading the story… I doubt it. Fortunately, the remaining characters, as well as the other elements of the story, more than made up for Genna’s weaknesses. The cat, in particular, intrigued me and kept me on my toes. Even Danrith, I saw the growth in his character, and his journey made me feel accomplishment. I do plan to read the second book in the series, which says more about how much liked the book than a thousand words could. As a counter-example, I never read the second book in Philip Pullman’s famed series, because the first let me down. Holly Lisle’s first book, however, did not me down. So that should give you a clue as to how strongly I liked it. It was totally fantasy and adventure. And the way Holly Lisle described the action sequences, I could see everything that was happening in my head. She used a lot of words I didn’t understand, but my dad explained them to me. I’m already looking forward to reading the next book in the series. The Ruby Key is a full-length juvenile fantasy novel, suitable for the high side of the age range, but well within reach even of a 9- or 10-year-old, especially with Mom or Dad’s help. We both heartily recommend it. Wonderful! BTW, Holly has announced that she is working on the third Moon & Sun book. We await with bated breath.